The Disk Clean Up tool gives you a quick way to delete files you no longer need from your computer. 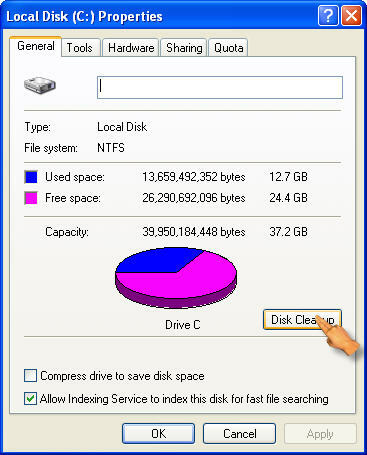 If your computer is running low on disk space, this is best place to start cleaning up your hard drive to open up more space. The easiest way to access the Disk Clean Up tool is opening My Computer (Start, My Computer), right-clicking on the drive you want to clean up and selecting Properties, General, then clicking on the Disk Cleanup button. 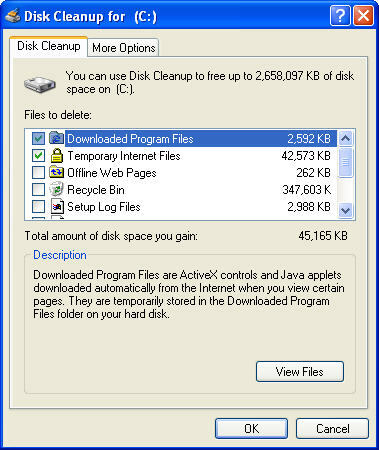 The Disk Clean Up tool will first scan your hard drive to calculate how much space deleting the unneeded files will save when you perform the disk clean up. Once a scan of your system is complete, you will see a listing showing you the different types of files you can delete, such as Temporary Internet Files. You will often find that this category makes up most of the files listed, especially if you use your computer primarily to surf the Web. Once you have selected the types of files you want to delete, click on OK to begin the clean up operation.